Bruce Betting have a promotion that runs every week from Friday to Thursday whereby you bet 10 x £10 and receive a £10 free bet. This offer isn't great but still worth it if you can find close matches and can most certainly be combined with other offers. All events and markets eligible. Offer only valid for first 50 weeks of account being open (max £500 in free bets). This offer should be combined with other Bruce Betting offers. Complete other offers and then place remaining bets to complete this offer every week before Friday for a £10 free bet. To trigger the £10 free bet, you must place 10 bets of at least £10 at odds of 2.0+. The easiest way to do this is to complete other Bruce Betting offers and note down how many bets you placed at 2.0+. Then on perhaps a Wednesday place the remaining amount of bets. The bets you have already placed were for an offer, so this £10 free bet is just going to reduce your qualifying losses a bit, or even make you a profit overall. Open up Bruce Betting and your exchange and find a close match between the back and lay odds for any event and any market. Alternatively you can use Oddsmonkey's Oddsmatcher and filter out Bruce Betting. Instead of looking for a match you can combine this offer with other Bruce Betting offers, so long as bets are placed and settled within the qualifying period. Bet £10 on Bruce Betting on the market of your choice. If not combining with any other offer, take no more than 50p loss a bet to make this worthwhile. 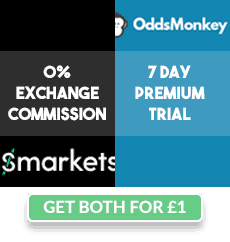 After your bets have settled you will receive a £10 free bet that can be used on any market with maximum odds of 11.0. This offer can be repeated weekly until your account has been open for 50 weeks. £500 in free bets a year is equivalent to around £400 cash. If you're combining with other offers then it's a free £400 you would never have had! Bruce Betting have regular price boosts and mid week offers such as Lead At Last (horses) and Lead And Lose (football). Combine with these and then on Wednesday see how many more bets you need to place and finish them. If doing this offer without combining; try to lose no more than 50p per £10 bet. If combining you can take a bigger loss but it's always good to keep it as low as possible for more profit!